FastKeys Policy Manager is a separate application which allows creating and editing specific policy settings before the software deployment to end users. You may need to run Policy Manager as administrator to run properly. Select Settings tab from the selection menu on the left to show the current active settings list. Few example items with most common settings are already included. Enabled settings will be preset and locked for end user. There are some special preferences which can only be set from the policy like LoadFile, DisableUpdates etc. Click a New button (or Insert button) to open a selection dialog which includes all possible FastKeys settings. Select a desired setting and press Select button to add it to the list. Click on a Active checkbox to disable or enable the settings item. Double click on the item (ore press Edit button) to edit the default settings (value and description). Use Delete button to remove items from the list. You can also drag and drop the items to re-arrange the list. Click Save button to finish and save policy settings or click Cancel button to keep the previous settings. Window will be closed and policy.ini file will be saved. 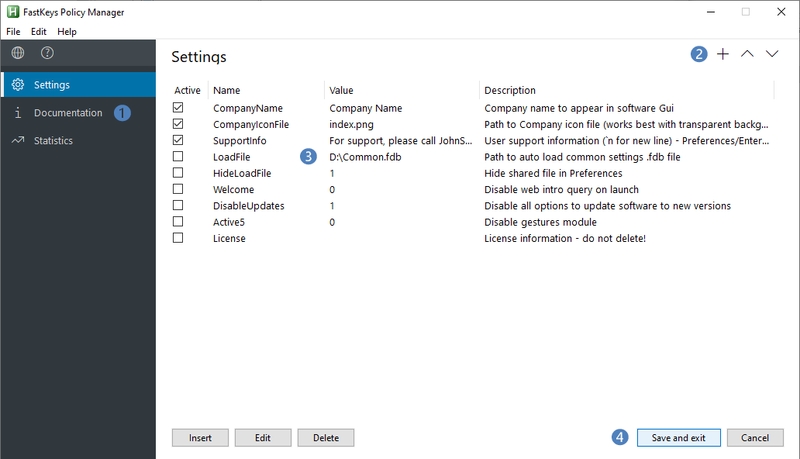 The policy.ini file is always saved to the Policy Manager folder.